An abstract flower at first glance... Look closer and you can see it's actually 5 hearts encircling a star on one side, and 5 overlapping hearts on the other side.. for 10 hearts total! But of course you don't really need a special occasion to buy it. 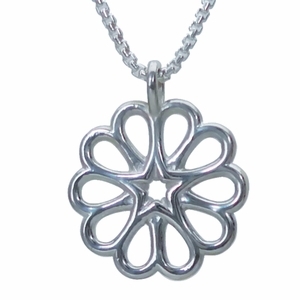 This playful rosette is a clever design, that can be worn anytime.